12-Months Supply $199 Save $38 Limited time offer. Regular price $227. 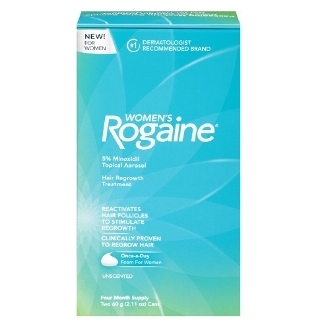 Women's Rogaine® Hair Regrowth Treatment, Once-a-Day Foam helps regrow thicker, fuller, beautiful hair. 5% this foam reactivates hair follicles to regrow hair. The only once-daily hair regrowth treatment for women approved by the FDA, this formula is clinically proven to help regrow hair in 81 percent* of women. Helps new hair come in up to 48 percent** thicker than before, with clinical results in as little as 12 weeks and visible results with continuous daily use after 24 weeks. From the number-one dermatologist recommended brand, the once-a-day applied foam can fit into your regular beauty routine. This package of Women's Rogaine® Foam includes two 60-gram (2.11 oz) cans, a four-month supply. For external use only. Extremely Flammable: Avoid fire, flame or smoking during and immediately following application. Ask a doctor before using if you have heart disease.